Asian or British Asian consultants earn 3.3% less than their white counterparts, while black, African, Caribbean, and British black consultants earn 2.3% less and consultants from mixed or multiple ethnic groups earn 3.1% less. To produce these charts, we combined the 22 staff groups in the NHS digital data into nine categories. The original groups are listed below the category titles on the graphs. The categories “Ambulance staff” and “Other doctors” are not presented here, as all ethnic groups contained fewer than 1000 people. To calculate the overall pay difference, we calculated an average of the differences across all nine categories. 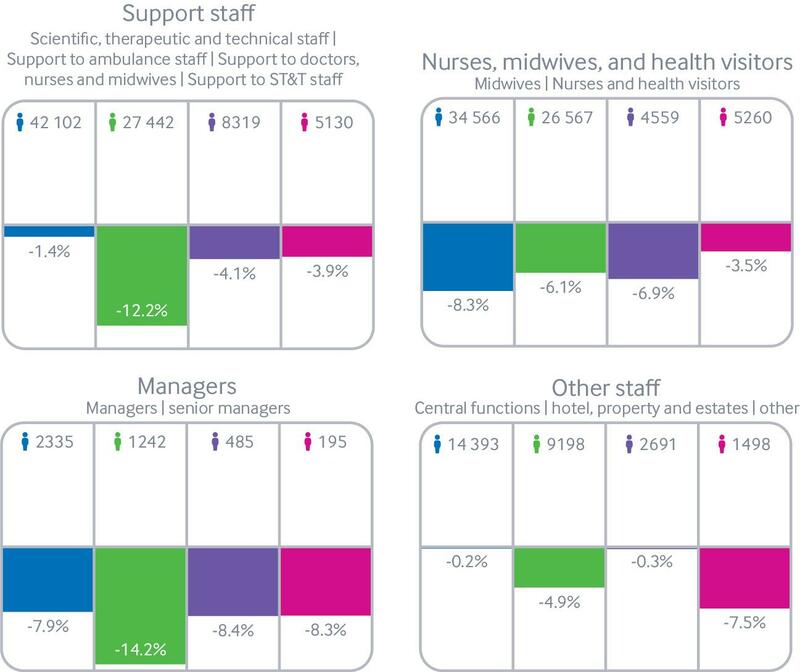 Among less senior doctors, the differences are less marked. Among staff and specialty and associate specialist (SAS) doctors, black, African, Caribbean, and British black doctors, and doctors from mixed or multiple ethnic groups, earn less than their white counterparts, though those from other ethnic groups earn more. Among doctors in training, doctors from mixed or multiple ethnic groups earn less than their white counterparts, but Asian or British Asian doctors, black, African, Caribbean, and British black doctors, and those from other ethnic groups earn more. Differences also exist across other staff groups. 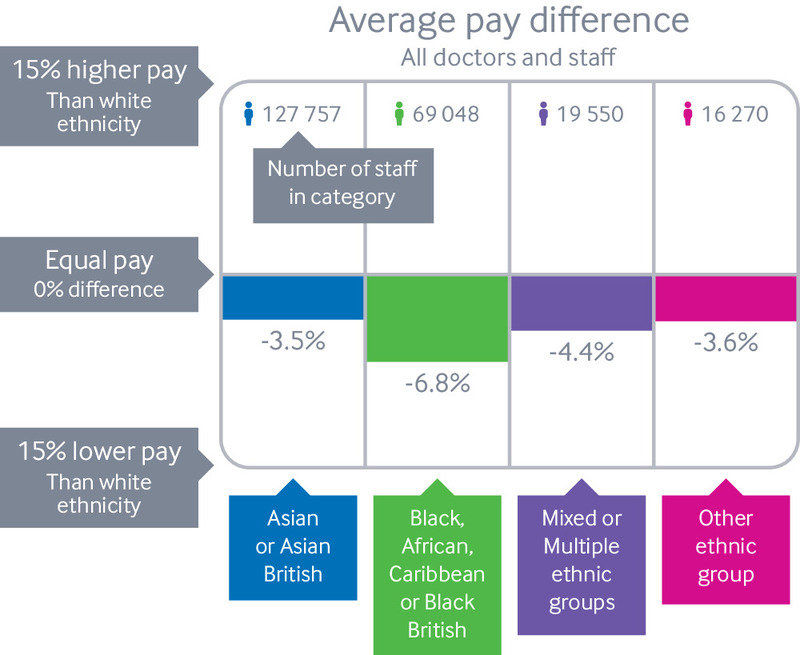 Looking at the average difference across all staff, black, African, Caribbean, and British black NHS workers earn 6.8% less than their white counterparts. Black, African, Caribbean, and British black support staff earn 12.2% less, and black, African, Caribbean, and British black managers earn 14.2% less. Asian or British Asian nurses earn 8.3% less than their white counterparts.